For other people named Frank Morgan, see Frank Morgan (disambiguation). Francis Phillip Wuppermann (June 1, 1890 – September 18, 1949), known professionally as Frank Morgan, was an American character actor on radio, stage and film. He was best known for his appearances in films starting in the silent era in 1916, and then numerous sound films throughout the 1930s and 1940s, mostly as a contract player at Metro-Goldwyn-Mayer, with his most celebrated performance playing the title role in The Wizard of Oz (1939). He was also briefly billed early in his career as Frank Wupperman and Francis Morgan. Morgan was born in New York City, to Josephine Wright (née Hancox) and George Diogracia Wuppermann. He was the youngest of 11 children, and had five brothers and five sisters. The elder Mr. Wuppermann was born in Venezuela, but was brought up in Hamburg, Germany and was of German and Spanish ancestry. His mother was born in the United States, of English ancestry. His brother, Ralph Morgan, was also an actor of stage and screen. The family earned their wealth distributing Angostura bitters, allowing Wuppermann to attend Cornell University, and joining Phi Kappa Psi Fraternity and the Glee Club. Morgan starred with John Barrymore in Raffles, the Amateur Cracksman (1917), an independent film produced in and about New York City. His career expanded when talkies began, his most stereotypical role being that of a befuddled but good hearted middle-aged man. By the mid-1930s, Metro-Goldwyn-Mayer had been so impressed by Morgan that they signed him to a lifetime contract. Morgan's best remembered film performances, are in The Wizard of Oz (1939): he played the Wizard and five other roles: the carnival huckster "Professor Marvel", the gatekeeper at the Emerald City, the coachman of the carriage drawn by "The Horse of a Different Color", the Emerald City guard (who initially refuses to let Dorothy and her friends in to see the Wizard), and the Wizard's scary face projection. Morgan was cast in the role on September 22, 1938. W. C. Fields was originally chosen for the role of the Wizard, but the studio ran out of patience after protracted haggling over his fee. An actor with a wide range, Morgan was equally effective playing comical, befuddled men such as Jesse Kiffmeyer in Saratoga (1937) and Mr. Ferris in Casanova Brown (1944), as he was with more serious, troubled characters like Hugo Matuschek in The Shop Around the Corner (1940), Professor Roth in The Mortal Storm (1940) and Willie Grogan in The Human Comedy (1943). MGM's comedy film The Great Morgan (1946), was written with the story centering on the latter. In 1939 Morgan played alongside Shirley Temple as Professor Appleby in Dimples. In the 1940s, Morgan co-starred with Fanny Brice in one version (of several different series) of the radio program Maxwell House Coffee Time, aka The Frank Morgan-Fanny Brice Show. During the first half of the show Morgan would tell increasingly outlandish tall tales about his life adventures, much to the dismay of his fellow cast members. After the Morgan segment there was a song, followed by Brice as 'Baby Snooks' for the last half of the show. When Brice left to star in her own program in 1944, Morgan continued solo for a year with The Frank Morgan Show. In 1947, Morgan starred as the title character in the radio series The Fabulous Dr. Tweedy. He also recorded a number of children's records, including the popular Gossamer Wump, released in 1949 by Capitol Records. Like most popular character actors of the studio era, Morgan was sought out for numerous supporting roles. He played Barney Wile in The Stratton Story (1949), which follows a baseball player (James Stewart), who makes a comeback after having his leg amputated due to a hunting accident. His final film, Key to the City (1950), was released posthumously. Morgan married Alma Muller (1895–1949) in 1914; they had one son, George (1916-2003). Their marriage ended with his death in 1949. He was widely known to have alcoholism, according to several who worked with him, including Margaret Hamilton and Aljean Harmetz. Morgan sometimes carried a black briefcase to work fully equipped with a small mini-bar. Morgan's niece Claudia Morgan (née Wuppermann) was a stage and film actress, most notable for playing the role of Vera Claythorne in the first Broadway production of Agatha Christie's And Then There Were None. Morgan was also a brother of playwright Carlos Wuppermann (1887-1919, stage/pen names Carlyle Morgan and Carlos Wupperman), who was killed in the Rhineland in 1919 while on duty there with the Army of Occupation. 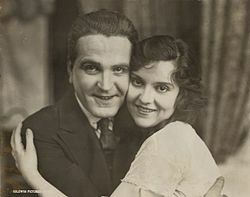 Wuppermann had only one play produced on Broadway, The Triumph of X which opened at the Comedy Theater in New York City on August 24, 1921, but ran for only 30 performances. The production starred Morgan, and also featured Helen Menken as the female lead. Also in the production for his first Broadway outing was Robert Keith, father of actor Brian Keith and one-time husband of Theater Guild actress Peg Entwistle. Morgan died of a heart attack on September 18, 1949, while filming Annie Get Your Gun. He was replaced by Louis Calhern for the film. His death came before the 1956 premiere televised broadcast on CBS of The Wizard of Oz, which made him the only major cast member from the film who did not live to see the film's revived popularity and become an annual American television institution. Morgan is buried in Green-Wood Cemetery in Brooklyn. His tombstone carries his real name, Wuppermann, as well as his stage name. Morgan was nominated for two Academy Awards, one for Best Actor in The Affairs of Cellini (1934) and one for Best Supporting Actor in Tortilla Flat (1942). He has two stars dedicated to him on the Hollywood Walk of Fame in Hollywood, California: one for his films at 1708 Vine Street and one for his work in radio at 6700 Hollywood Boulevard. Both were dedicated on February 8, 1960. 1939 Broadway Serenade Cornelius Collier, Jr.
^ Obituary Variety, September 21, 1949, page 63. ^ The National cyclopaedia of American biography: being the history of the ... - James Terry White - Google Books. Books.google.ca. Retrieved September 18, 2012. ^ Playbills to Photoplays - New England Vintage Film Inc Society, New England Vintage Film Society, Inc. - Google Books. Books.google.ca. Retrieved September 18, 2012. ^ Grand Catalogue of the Phi Kappa Psi Fraternity - Twelfth Edition, p.377: Bernard C. Harris Publishing Company, 1985. ^ Slon, Michael (1998-01-01). Songs from the Hill: A History of the Cornell University Glee Club. Cornell University Glee Club. ISBN 9780962010316. ^ Dunning, John (1998). On the Air: The Encyclopedia of Old-Time Radio (Revised ed.). New York, NY: Oxford University Press. pp. 259–260. ISBN 978-0-19-507678-3. ^ "Frank Morgan at Hollywood's Irish Mafia". Archived from the original on 5 August 2009. Retrieved 18 September 2009. ^ Theater Review by Alexander Woollcot New York Times, August 25, 1921. ^ "Internet Broadway Database". Archived from the original on 2012-07-25. ^ "Desert Sun 20 September 1949 — California Digital Newspaper Collection". cdnc.ucr.edu. ^ a b Doug Fuhrmann, "Pop Culture History: Wizard of Oz televised (1950s), The Daily Journal.com April 6, 2009 Archived August 24, 2014, at Archive.today. Accessed 24 August, 2014. Wikimedia Commons has media related to Frank Morgan.